(Central Islip, N.Y., Feb. 11, 2019) – The Long Island Ducks today announced the team will host a qualifying competition on Thursday, May 9th, at Bethpage Ballpark for the annual Nathan’s Famous Fourth of July Hot Dog Eating Contest. The hot dog eating qualifier will take place prior to the Ducks 6:35 p.m. game against the Southern Maryland Blue Crabs on May 9. Gates to the ballpark will open at a special time of 5:00, with the competition getting underway at approximately 5:30. 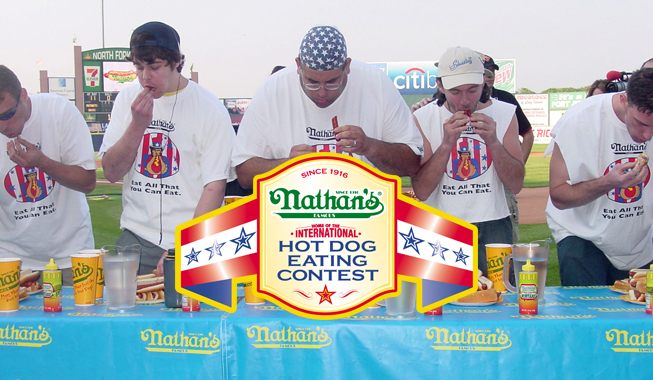 Up to 20 contestants will take part in the event, with the top male and female finishers earning the right to compete at the Nathan’s Famous Hot Dog Eating Contest on July 4th at Coney Island. Additionally, the winners will receive a round trip ticket to New York and hotel accommodations. In recent years, an estimated 35,000 fans have made the pilgrimage to the corner of Surf and Stillwell Avenues in Coney Island to watch the Nathan’s Famous Fourth of July Hot Dog Eating Contest in person. At the 2018 event, Joey Chestnut of San Jose, Calif., ate 74 Hot Dogs and Buns in 10 minutes to set a new World Record. Miki Sudo of Las Vegas, Nev., won the Ladies’ Title with 37 Hot Dogs and Buns. Do you have what it takes to challenge the reigning World Champions? If so, step up to the table for your shot at becoming a part of history! Please note, all participants must be 18 years of age or older. CLICK HERE to sign up for the 2019 hot dog eating qualifier at Bethpage Ballpark. Nathan’s Famous has nearly 300 restaurants all over the world including Russia, Australia, Malaysia, the Dominican Republic, Jamaica, Panama, the Philippines, and the UK. There are Nathan’s restaurants up and down the eastern seaboard, and scattered across the Midwest and west including Texas, Illinois and Nevada. Nathan’s products are available in arenas and stadiums all over the country, as well as movie theaters, colleges and universities, travel plazas, amusement parks, casinos and hotels. Nathan’s available prototypes are full menu restaurants large and small, as well as carts, kiosks, trailers and trucks. Nathan’s Famous products are currently sold in more than 58,000 retail and food service locations, and are available in all 50 states, the District of Columbia, Puerto Rico, the U.S. Virgin Islands, Guam, the Cayman Islands, and in 12 foreign countries. Through all channels of distribution, over 600 million Nathan’s world famous beef hot dogs were sold last year. For additional information about Nathan’s Famous please visit www.nathansfamous.com.